No charges will be brought against the former Miss England over allegations she assaulted a rival beauty queen. Rachel Christie was accused of punching Miss Manchester, Sara Beverley Jones, 24, at a nightclub in Manchester in November 2009. But the case is being dropped by the Crown Prosecution Service (CPS) because of a lack of evidence. 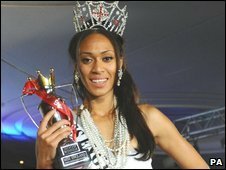 Ms Christie, the first black woman to be crowned Miss England, relinquished her crown last year to clear her name. CPS reviewing lawyer, Mark Callaghan, said: "I can confirm that, following the application of the Code for Crown Prosecutors - the guidance that all Crown Prosecutors must follow - the CPS has concluded that there is insufficient evidence to bring charges against any individual in relation to an allegation of assault on a female on November 1 2009 at the Mansion nightclub in Manchester city centre."